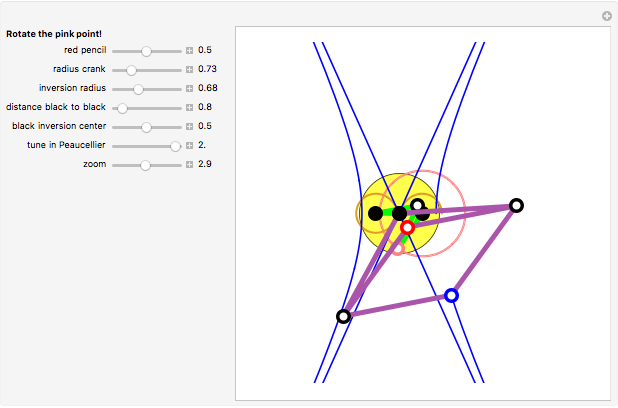 This linkage was originally designed to draw ellipses and hyperbolas. This Demonstration generalizes this too-restrictive usage. A purple Peaucellier linkage is coupled to a green trapezoidal linkage (see the Demonstration "Families of Figure-Eight Curves"). The Peaucellier cell draws a blue curve that is obtained by inversion from the red curve drawn by the trapezoidal linkage. Varying the radius of the crank (the distance been the outer black points) with the original settings will change the blue ellipse smoothly into a blue hyperbola. This is not surprising as they are both conic sections. You can create this linkage with a Meccano set; see the details. Find your old Meccano set or ask your son. Take a pair of equal green short rods and a pair of equal long ones. Nail the ends of a rod, letting two other rods rotating around its end points. Connect the fourth rod to their free ends. Insert a red pencil somewhere in the fourth rod (the red point in the figure). 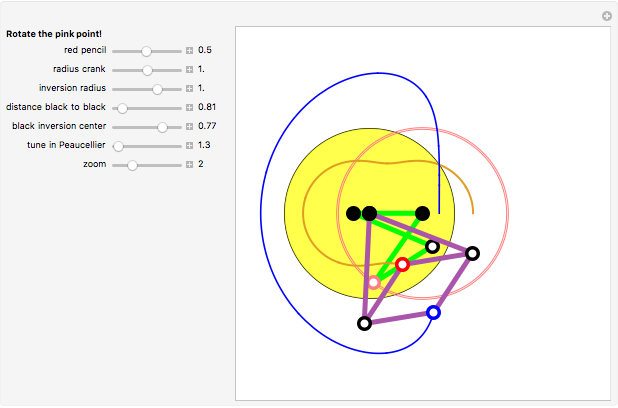 The first linkage drawing eight curves is ready. Now take four (long enough) equal purple rods and a pair of still longer equal purple rods. Nail the black point of this Peaucellier linkage somewhere between the black points of the first linkage (this is the center of the inversion circle). Anchor the red point to the red point of the first linkage. Insert a blue pencil at the free end. Everything is done. Rotating the crank (the locator) causes the device to draw a red figure-eight curve and its blue inverted curve. 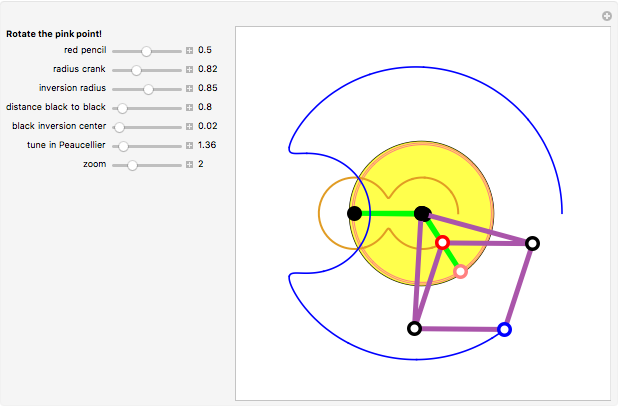 The longer the lengths of the Peaucellier linkage, the greater the portion of curve you can draw. If is the length of the four shorter Peaucellier rods and is the length of the two longer ones, the radius of inversion will be . The yellow disk that shows the inversion circle can be left out. Claude Fabre "Linkage Inverting Figure-Eight Curves"